A manuscript design for this model of stool is in Gillows' Estimate Sketch Book, 1827, p. 3568, as A Mahogany Grecian Dressing Stool with a price of £1 15s. 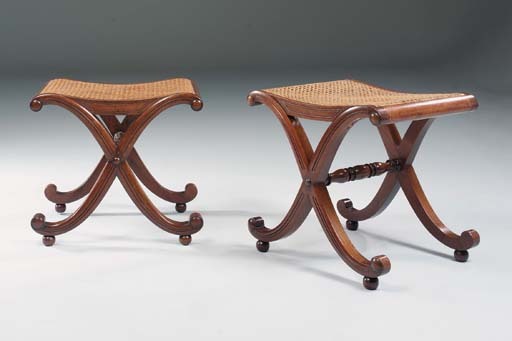 Stools of an almost identical form were supplied to Tatton Park, Cheshire, in 1812 (N. Goodison and J. Hardy, 'Gillows at Tatton Park', Furniture History, 1970, pl. 22). Further stools of this model were supplied to William, 2nd Baron Bolton (1782-1850) for Hackwood Park, Hamsphire, in mid-1813 and one of these was sold in Christie's house sale, 20-22 April 1998, lot 365. An almost identical stool supplied to William, 4th Earl Fitzwilliam (d. 1833) was sold in the Wentworth sale, in these Rooms, 8 July 1998, lot 84 (£11,000 + premium).